Keep your flock content, comfortable and secure at home with these housing suggestions that cover bedding, ventilation, cleaning and weatherproofing. Just as mankind has evolved from inhabiting dank, dark caves, today’s domestic chickens have needs no longer met by the cover of a rainforest. The ancestral red junglefowl might have survived just fine in the wilds of Asia, but today’s modern flocks face many more challenges. These include diverse weather conditions, seasonal temperature changes, a wide variety of predators and our own impact on the world around us. Help ensure your birds live a long, healthy life by following these dos and don’ts for providing proper housing. Regardless of whether you choose a mobile chicken tractor or a permanent coop for housing, make sure that your chickens’ shelter is exclusively for them. Housing them with other animals—especially larger livestock—can result in fretful temperaments, accidental injury and even death. Bunking your hens with other birds, such as turkeys, is also not recommended, due to possibility of illnesses such as blackhead disease passing between bird species. The costliest designer coop is completely worthless as housing for chckens if it can’t keep out precipitation. Roofs, doorways and windows that leak let rain and melting snow into the henhouse, chilling your birds; creating a mucky mess of the floor and droppings; encouraging mold, mildew and bacterial growth; and potentially causing conditions such as frostbite and bumblefoot. Before your birds move in, thoroughly caulk and seal your coop to keep out drafts and wetness. Your girls may be sweet natured, but the byproducts they create most definitely are not. Without proper ventilation in housing, the carbon dioxide released by their breathing and the hydrogen sulfide, carbon dioxide, methane and ammonia released by their droppings will remain trapped within the coop, creating a noxious cocktail of fumes potential lethal to your layers. A well-ventilated coop allows for these gases to safely dissipate while permitting in fresh air. Proper ventilation also allows the heat and moisture naturally generated by your birds to escape, an important consideration in summer, when high temperatures and humidity can adversely affect a flock. Too much of a good thing can be just as detrimental to your chickens as too little, especially when it comes to airflow in housing. While generously proportioned ventilation openings allow harmful gases to exit, they also permit chilly air and precipitation to enter. This could be disastrous, depending on your geographic location and the breed(s) you’re raising. My New Jersey friend learned this the hard way. She had read at an online poultry blog that 1⁄5 of her henhouse’s walls should be vents and faithfully had her coop built with the upper 1⁄5 nothing but open space and structural supports. Her Silkies and bantams had plenty of fresh air during the summer and fall, then became chicksicles when a November nor’easter struck. Like all other birds, chickens instinctively perch to rest, sleep and exercise their feet. They’ll preen on a perch, trim their talons on a perch and even socialize on a perch. They also seek the security of higher ground—such as a perch—when they feel alarmed. Outfitting your coop with a roost not only contributes to your flock’s health and well-being but also to its comfort and happiness. No matter how luxuriously outfitted your housing may be, your flock will go stir crazy if it can’t get out and roam. Chickens are naturally inquisitive creatures. They need to explore, scratch, dig and otherwise adventure out in their run or, if you free-range, your yard. While an occasional shut-in day might occur due to severe winter weather, even when there’s snow on the ground, open your henhouse door to offer your girls the option to go out. Hens naturally seek out the darkest, quietest place to lay their eggs, an instinct dating back to the drive to protect the next generation. Adding nest boxes to the henhouse will give your girls a safe and convenient place in which to lay and an easy egg-collection location for you. Supply one nest box for every four hens in your flock to prevent them from all crowding together to lay at the same time. The sturdiest nest box won’t be worth much if you neglect to provide nesting material. Your hens will lay their eggs inside but, without a soft liner to catch the egg, all their efforts will be scrambled. Nest-box lining material should be soft, absorbent, inexpensive and easy to clean. Straw, grass clippings and wood shavings are all excellent bedding choices for chicken housing. The hens can shape these to their hearts’ desire before settling down to lay and, when soiled, the litter can be effortlessly composted. Some poultry-supply companies sell ready-made nest-box pads of aspen and pine fibers, which cut down on mess and last longer. From the neighbor’s dog to the evening opossum, everyone wants to get at your girls. If you’ve chosen a confined coop or a coop with an attached run for your flock, invest in secure fencing material to keep out potential predators. Dig your fencing material down 18 to 24 inches below ground surface; this will thwart digging carnivores such as raccoons from reaching their destination. Use 1⁄4-inch hardware mesh for at least the lower 3 feet of your run; the tightly-woven wire will prevent predators from reaching through the fence to grab at your birds and will keep your chicks and juveniles from escaping. Be sure to cover your ventilation openings with 1⁄4-inch mesh as well. Standard 2-by-4 mesh might keep raccoons from getting in but won’t block access to weasels and smaller predators. Raising chickens can be an addictive pleasure. You set out to raise perhaps four hens and, the next thing you know, you’ve got 11. While a flourishing flock is a joy to have, housing them in undersized accommodations can turn that joy into a nightmare. Birds that feel crammed and overcrowded quickly become stressed; they start picking their own and their coop-mates’ feathers, slow down or cease egg production, and fight amongst themselves. Don’t buy into the “birds only use their coop to sleep at night, so it can be small” myth. Like anybody else, chickens need room to move, spread their wings, walk around and socialize. If your flock’s feeders and waterers are installed inside your coop, sufficient space around these is vital to prevent jostling and brawls as your birds try to eat and drink. Lack of interior housing space can also physically affect your flock’s health, especially if there is poor ventilation. Dust is a chicken’s natural companion. No matter how tidy you personally may be, you’ll be fighting a losing battle if you expect your henhouse to look like a gardening magazine photo spread. 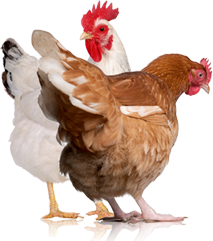 Dust comes from a hen’s skin, feathers and droppings. It comes from chicken feed and bedding material. It comes from the outdoors. 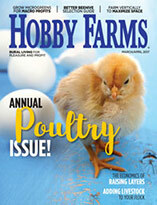 It’s ubiquitous in the world of poultry keeping. Beyond dust and grime, however, is the handling of your flock’s manure. Again, cleaning frequency will depend on the size of your flock. 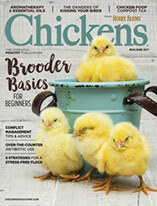 When it’s time to get down and dirty, wear work gloves and use an assortment of tools—shovels, rakes, brooms and hand spades that you keep solely for poultry chores—to scoop the poop and soiled litter from every nook and cranny of your coop. Use a wheelbarrow to cart the manure and litter to your compost heap. (Check your local ordinances regarding the disposal of livestock manure.) Then, thoroughly clean and sanitize your coop. Your chickens will act as if you’ve given them a new home and will spend hours exploring their tidied surroundings. Even though your henhouse is specifically for the birds, you will need to be able to access the interior for a wide assortment of reasons: cleaning, reaching for an egg laid out of place, refilling feeders and waterers, and tending to ill or injured birds that are hiding in corners. Be sure to design a human-sized access door to your coop’s central area, and don’t forget to add an access panel to your nest boxes, so you can collect eggs without having to go inside the henhouse to do so. Regardless of what size, architectural design, and décor you select for your henhouse, by following these guidelines, you’ll provide your chickens with a comfortable, secure shelter they can call home for years to come.